Fashion is cyclical. So every few years, a style or trend comes along that we haven't really seen much of in about a decade. Like these shirts. Call them what you will—band collars, grandad collars or simply collarless shirts—but you get the idea. A simple woven shirt that appears as if the collar's been lopped off. It's a look born out of yesteryear and yet, when worn casually with rolled up sleeves or layered under an unstructured blazer, looks very much right now. 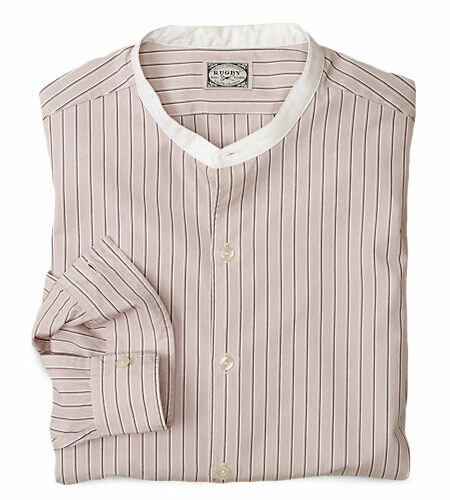 After all, a man should have some variety in his shirting arsenal. This allows you to stay within the colors and fabrics that work for you while switching up the collars for a unique twist. And should you want to save a little dough, start digging around vintage shops for similar styles and have them tailored to suit today's proportions. Ralph Lauren launched the Rugby brand in 2004.